A vacuolar degeneration affecting primarily the gray matter in the central nervous system (CNS) of young Australian Cattle Dogs is described. An initial presentation of seizures was followed by a progressive spastic tetraparesis. Grossly evident bilateral and symmetrical foci of malacia were in the nuclei of the cerebellum and brain stem and the gray matter of the spinal cord. 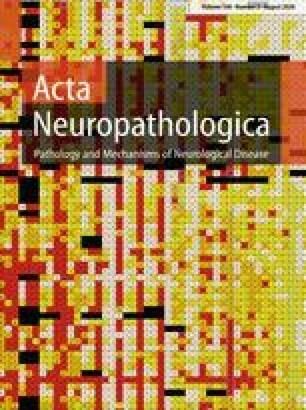 Microscopically, vacuolation of glial cells, dilation of the myelin sheaths and reactive astrocytosis characterized mild CNS changes. More advanced lesions displayed progressive dissolution of the neuropil, prominent vacuolation of reactive astrocytes, numerous glial fibrillary acidic protein-positive coiled astrocytic processes, neuronal vacuolation and loss with relative sparing of large neurons. Ultrastructurally, marked mitochondrial accumulation and swelling were seen in astrocytes. In the appendicular muscles, changes interpreted as long-term denervation atrophy accompanied by widespread expression of the neonatal isoform of myosin were observed. The character of the neurological signs, the nature and the distribution of the lesions within the neuroaxis have not been reported in domestic animals. An inherited biochemical defect, possibly mitochondrial, is proposed as the cause. Selected conditions with a bilateral and symmetrical distribution affecting the gray matter of domestic animals are summarized.